I’ve been thinking about peaches and cream for weeks. I have no idea why. Sometimes my brain just grabs hold of an idea and won’t let it go. I got tired of my brain nagging me with thoughts like, “Wouldn’t those fresh peaches be great with some vanilla pasty cream?” and “I bet peaches and gingersnaps taste awesome together”, so to shut it up I made these tarts. Turns out my brain was right. What I had in mind was a cookie-like crust filled with cool, creamy vanilla bean pastry cream, topped with fresh peach slices… and that’s exactly how these tarts turned out. Instead of using graham crackers for the crust, I decided to use gingersnaps for a little gingery kick. The crust has just the right amount of spice without overpowering the peaches or pastry cream. Each bite of the finished tarts has a delightful balance of crunchiness from the crust and silkiness from the pastry cream. They’re wonderful. Hurry up and make some of these before peach season ends! For easy entertaining, bake the crust and make the pastry cream the day before. Refrigerate pastry cream and store the crusts in a zip-top plastic bag at room temperature overnight. The day of serving, fill the tarts with pastry cream, top with peach slices and serve. In a medium saucepan, warm milk, 1/4 cup sugar, vanilla bean and seeds, and salt over medium heat. Bring to just about a simmer (do not boil) and remove from heat. In a medium bowl, whisk together egg yolks, cornstarch, and remaining 1/4 cup sugar. Whisking constantly, slowly pour about 1/2 cup of the hot milk mixture into egg yolk mixture. Whisk in remaining milk mixture, then pour everything back into saucepan. Cook over medium heat, whisking constantly, until thickened. (Instant read thermometer will read about 160°F.) Remove from heat. Discard vanilla bean pod. Fill a large bowl with ice and cold water. Set a fine mesh strainer over medium bowl. Strain pastry cream into medium bowl. Whisk in butter and yogurt. Set bowl in ice water bath and whisk until cool, about 5 minutes. Cover with plastic wrap, pressing it against the surface, and refrigerate at least 4 hours or up to overnight. Combine gingersnap crumbs and pecans in food processor. Pulse until finely ground. With the food processor running, pour in melted butter. Pulse until mixture resembles wet sand. Divide among 4 non-stick tart pans. Using the back of a measuring cup, press crumb mixture firmly into tart pans. Set filled tart pans on a baking sheet. Bake at 350°F for 10 minutes. Cool completely on a wire wrack. (Do not remove from pans.) Can be stored overnight in an airtight plastic bag. 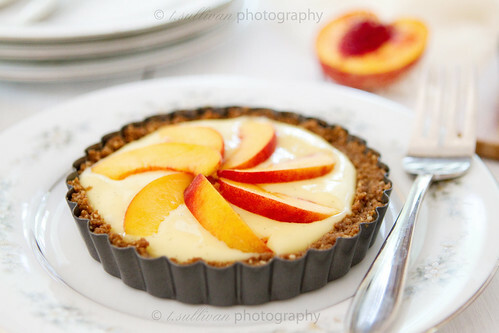 To assemble, spoon pastry cream into cooled crusts (you may have some left over) and top with sliced fresh peaches. What gorgeous photographs and more gorgeous tarts! Yum! Mmm, looks like we both have peaches on the brain, I’m about to post something with peaches, too. The gingersnap crust is a great idea, these look so good! Wow, these are some beautiful tarts and pictures. I’d love to try these! Just beautiful color in these photographs! Looks absolutely delicious. 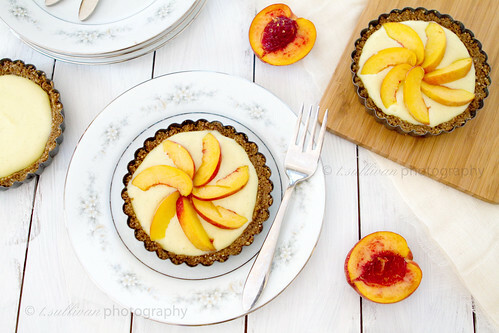 Peaches are pretty much one of my fave fruits ever (I’m nomming on a peach and mango sorbet now :D), and these tarts look fab! The colours accented in the photos are amazing, as well. What type of camera/lens set do you use? Both of these photos were taken with my Canon 7D and 24-70mm f2.8 L lens. Great looking tarts!! Thanks for the easy recipe!! Gorgeous peach tarts…. hats off to you! There is nothing better that ripe fruit on pastry cream! Peaches are super delicious and juicy right now! I can’t get enough! Um. I need to have these. Now. These tarts are gorgeous and they sound divine! Your blog title is so fitting, because every time I come here, I’m craving what I see. Awesome recipe.